Fanm d’Ayiti (Women of Haiti) is an evening-length work for voice, flute, string quartet and electronics developed by composer/performer Nathalie Joachim. Commissioned by St. Paul Chamber Orchestra’s Liquid Music Series, Fanm d’Ayiti is a celebration of some of Haiti’s most iconic yet under recognized female artists, as well as an exploration of Joachim’s Haitian heritage. 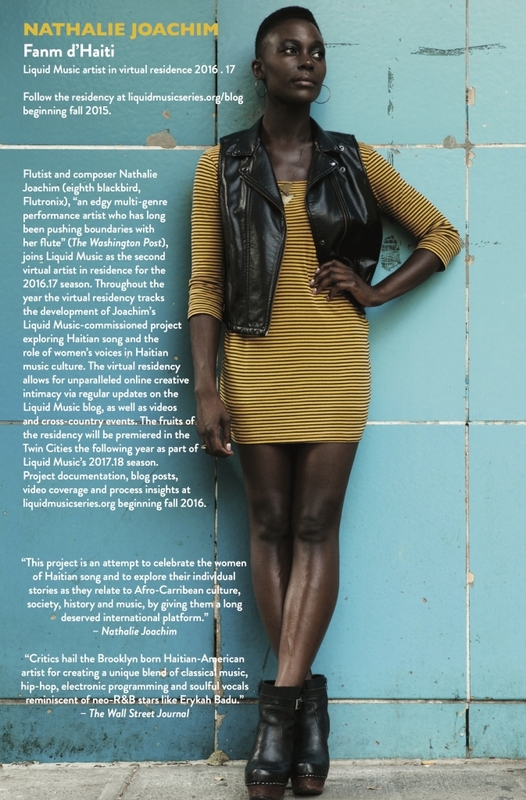 The project features original songs incorporating the recorded voices of Joachim’s grandmother and the girls choir of her family’s home farming village of Dantan; new arrangements of songs by some of the greatest known female voices in Haitian history; and recorded interviews with these artists about their lives fighting for social justice and uplifting the people of Haiti. Developed in a two year Liquid Music Virtual Residency, Fanm d’Ayiti premiered in March 2018 with members of SPCO in St. Paul, MN, and will be presented in the 2018-19 and 2019-20 season with Spektral Quartet. This project is made possible in part through funding from The Jerome Foundation, New Music USA and the Chauncey and Marion Deering McCormick Foundation. This project is an attempt to celebrate the women of Haitian song and to explore their individual stories as they relate to Afro-Caribbean culture, society, history and music, by giving them a long deserved international platform. Flutist and composer Nathalie Joachim (Eighth Blackbird, Flutronix), “an edgy multi-genre performance artist who has long been pushing boundaries with her flute” (The Washington Post), joins St. Paul Chamber Orchestra’s Liquid Music series as the second virtual artist in residency for the 2016.17 season. Throughout the year the virtual residency will track the development of Joachim’s Liquid Music-commissioned project exploring Haitian song and the role of women’s voices in Haitian music culture. The virtual residency allows for unparalleled online creative intimacy via regular updates on the Liquid Music blog, as well as videos and cross-country events. The fruits of the residency will be premiered in the Twin Cities the following year as part of Liquid Music’s 2017.18 season.